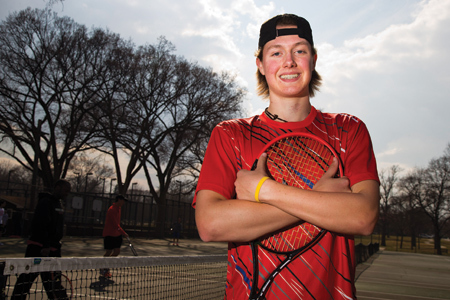 Hinsdale Central junior Martin Joyce didn’t know what to expect in his first high school tennis match two years ago on a cold spring day at Burns Field in Hinsdale. Martin—then just a freshman—not only got the nod at No. 1 singles, but he also pulled off a stunning three-set win over eventual State Champion Jason Brown of Deerfield. Martin’s career has only continued to thrive from that point. The 6-foot-3, 175-pounder with a big serve went on to place fourth at state in singles as a freshman while helping Hinsdale Central win the state team title. Last season, Martin became the school’s first state singles champion since Tom Buetikofer in 1997 while spearheading his team’s state title repeat with a record 59 points. Another special moment for Martin came in January, when he made a verbal commitment to Ohio State University, the No. 2-ranked college program in the nation. “It’s gotten me to work even harder now that I have this big thing ahead of me,” he says. Now Martin has turned his attention to defending his individual and team state titles. That’s the kind of attitude that Coach Naisbitt has come to expect from Martin. Martin spends an average of three hours on the court five or six days per week and 30 or 40 minutes more on conditioning. That’s why he has made continued progress during high school. Martin showed that mental toughness at the end of his 6–3, 3–6, 6–4 victory over Waubonsie Valley senior Eric Marbach in last year’s state final. “When it got to be 4–4 (in the third set) I just remember thinking that this was going to be the game that I was going to break him (on serve),” recalls Martin, who did just that. This season, Martin’s top challenger at state May 29 to 31 figures to be teammate Michael Lorenzini, who took third at state in singles last year.